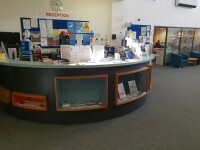 Services / facilities within the building include Prescot One Stop Shop and Prescot Museum. 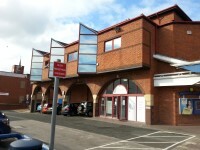 Related link Prescot Shopping Centre. 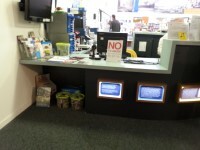 Related link Prescot One Stop Shop. The nearest National Rail station is Prescot. 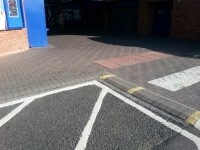 The dimensions of the Blue Badge parking bay(s) are 350cm x 470cm (11ft 6in x 15ft 5in). 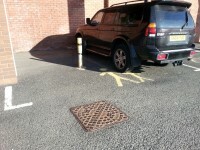 The nearest Blue Badge bay is 8m (8yd 2ft) from the Prescot library entrance. 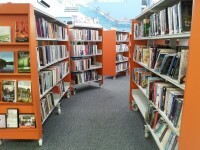 The furthest Blue Badge bay is 26m (28yd 1ft) from the Prescot library entrance. 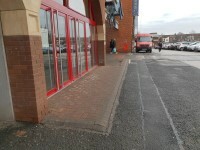 There are uneven surfaces on route to the shopping centre car park entrance caused by kerbstones and traffic calming ramps. 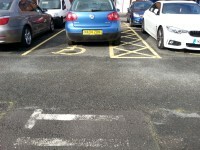 There are Parent and Child Parking bays. 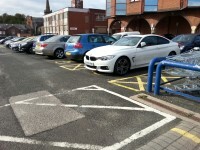 The Parent and Child bays are located next to some of the Blue Badge bays. 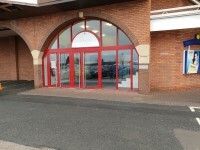 This information is for the entrance located in the car park. The width of the door opening is 91cm. There is not a/are not handrail(s) at the ramp. 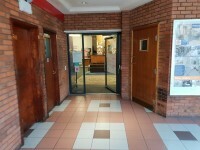 This entrance leads to a lobby area with stairs and a lift. 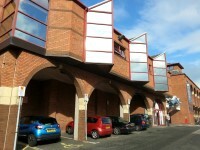 You are on Other Floors (Car Park Entrance). Skip to the next section. 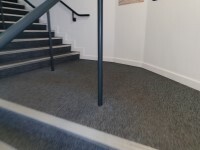 The steps are medium height (11cm - 17cm). 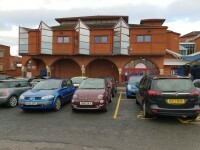 You are on Lift (Car Park Entrance). Skip to the next section. 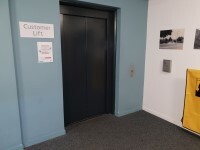 The lift is located to the left as you enter the car park entrance. 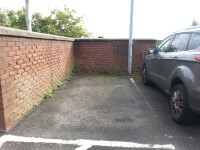 The lift is approximately 4m (4yd 1ft) from the car park entrance. 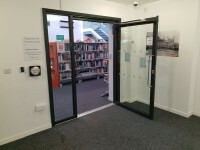 The clear door width is 81cm (2ft 8in). 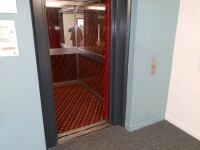 The dimensions of the lift are 134cm x 196cm (4ft 5in x 6ft 5in). 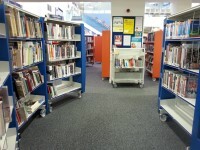 You are on Entrance (Library - First Floor Entrance). Skip to the next section. This information is for the entrance located on the first floor. 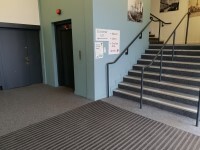 There is step-free access at this entrance, via lift. The push pad or push button is 96cm from floor level. The width of the door opening is 90cm. 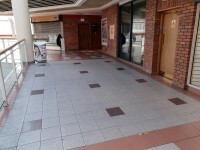 You are on Outside Access (Prescot Shopping Centre - First Floor Entrance). Skip to the next section. 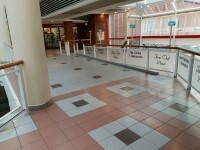 This information is for the entrance located on the first floor of Prescot Shopping Centre. The width of the door opening is 111cm. 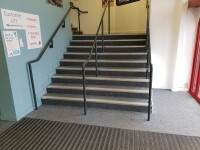 The ramp/slope is located on the approach to the entrance. 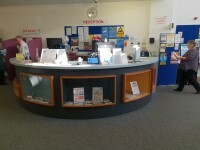 You are on Reception (Library, Museum and One Stop Shop). Skip to the next section. 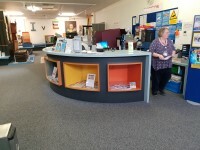 The desk/counter is 10m (10yd 2ft) from the first floor car park entrance. 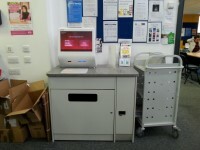 The touch screen is not at a suitable height for a wheelchair user. 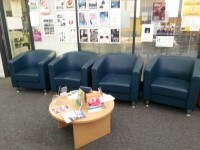 There is seating to the right of the reception desk. 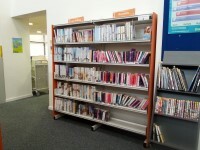 This library does have a regular supply of books in audio format. 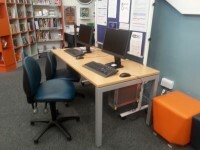 A height adjustable chair is / are available. 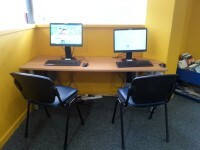 Equipment available for people with a visual impairment includes magnifying software. You are on Changing Places. Skip to the next section. 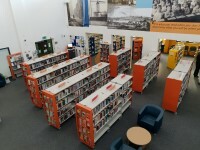 The facility is located on the first floor, towards the rear of the library area. 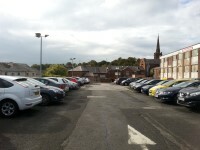 The facility is approximately 11m (12yd 1in) from the first floor car park entrance. 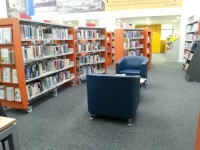 There is level access to the facility. You do need a key for the facility. It is a radar key. The key can be obtained from the main reception. The width of the door is 84cm (2ft 9in). 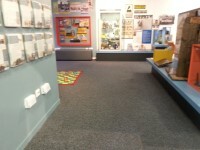 The dimensions of the facility are 280cm x 367cm (9ft 2in x 12ft). The facility changing bench height is adjustable. The facility changing bench is wall mounted. 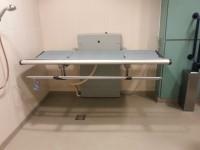 The length of the facility changing bench is 187cm (6ft 2in). The facility hoist is powered overhead. 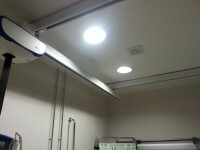 The overhead hoist covers all areas in cubicle. The sling is attached to the hoist by hook and loop. The facility toilet is peninsular. The transfer space on the left as you face the toilet is 272cm (8ft 11in). 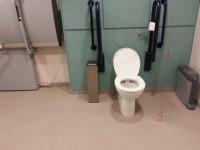 The transfer space on the right as you face the toilet is 80cm (2ft 7in). Wall mounted grab rails are available. Drop down rails are provided. As you face the toilet the drop down rail(s) is/are on both sides. The type of wash basin is adjustable. 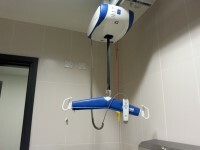 Wall mounted grab rails are not available at the wash basin. A privacy screen is available. Wide tear off paper roll is available. 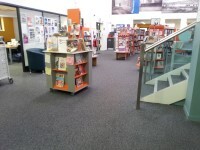 The facility has not got a non slip floor. A functioning emergency alarm is available. 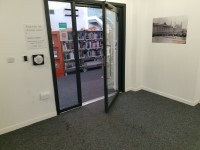 The changing place is located through a locked door. 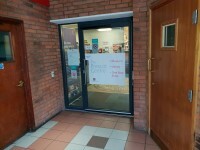 The door is opened electronically from the main reception. 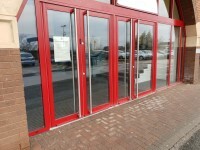 Please ask a member of staff to open this door. The width of the door is 90cm. The door opens away from you (push). 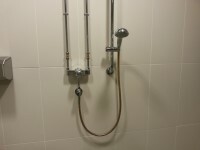 You are on Standard Shower (Changing Place). Skip to the next section. The shower(s) surveyed is/are located within the changing place. 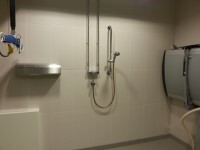 There is level access to the shower facilities. 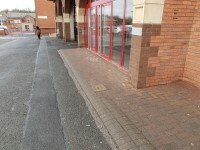 This accessible toilet is approximately 11m (12yd 1in) from the first floor car park entrance. 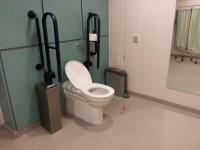 This accessible toilet is located on the first floor, to the rear of the library. The width of the accessible toilet door is 76cm (2ft 6in). 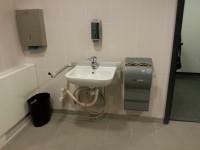 The dimensions of the accessible toilet are 195cm x 256cm (6ft 5in x 8ft 5in). The lateral transfer space is 131cm (4ft 4in). 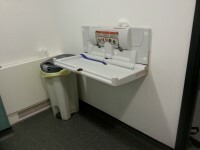 The height of the baby change table once extended is 86cm (2ft 10in). 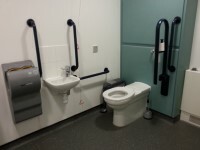 The accessible toilet also serves as a standard unisex toilet. The accessible toilet is located through a locked door.